We are halfway through the week – only a few more days until the weekend! 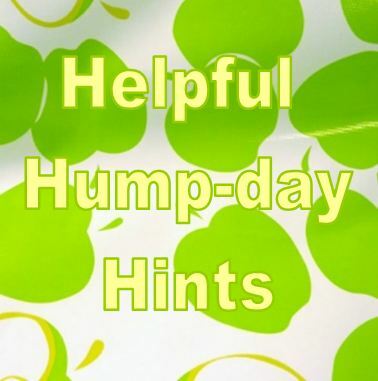 Here are my HHHs (Helpful Hump-day Hints) for this week. This week I decided to concentrate on the kitchen. HHH#1 Put away the dishes from the dishwasher or drying rack and wipe down all the counters and appliances. HHH#2 Organize your spice rack / cabinet. Do you have multiples of one kind of spice? Combine them. Saving containers with just a dash left in it? Leave them on the counter and incorporate them into tonight’s meal. HHH# Instead of making coffee this morning, run a pot of just vinegar to clean out your coffeemaker. Treat yourself to Starbucks or Dunkin Donuts on the way to work. Did you do any HHHs to get a jump start on your weekend to-do list? Make a comment and let me know. Do you dilute the vinegar with water, or just straight vinegar? I dilute with water – but I am pretty sure it is safe either way. How do you do it? I’ve never tried it, but I’m going to! I unloaded the dishwasher and put away everything on the drying rack this morning. It will be satisfying to return home to a clear counter.